Time seems to be running out and investors are turning impatient. And if mutual fund distributors are to be believed, the hugely successful campaign of ‘Mutual Funds Sahi Hai’ run by the Association of Mutual Funds of India (Amfi) doesn’t seem to be cutting ice with many investors these days. What’s the fuss? Although a little more than Rs 8,000 crore came into mutual funds (MFs) through systematic investment plans (SIPs) in the month of December 2018, the pace of inflows has slowed down. As per data given to us by industry officials who did not wish to be quoted, the MF industry got just 7.58 lakh new SIPs in November 2018 and 7.23 lakh new SIPs in December 2018. Between May and September 2018, the average new SIPs added every month was 10 lakh. A total of 5.36 lakh SIPs got discontinued in December 2018, up from 4.44 lakh SIPs in November 2018 and 4.66 lakh SIPs. As per Computer Age Management Services (CAMS; one of India’s largest registrar and transfer agents in the MF industry), the MF industry registered 5.50 lakh new SIPs in the month of November 2018; the lowest in the past 13 months and a drop of nearly 30 percent since the previous month. Why are investors at the exit gate? Investors that invested in MF through SIP in the past three or so years are still either sitting on losses or have earned abysmal returns. 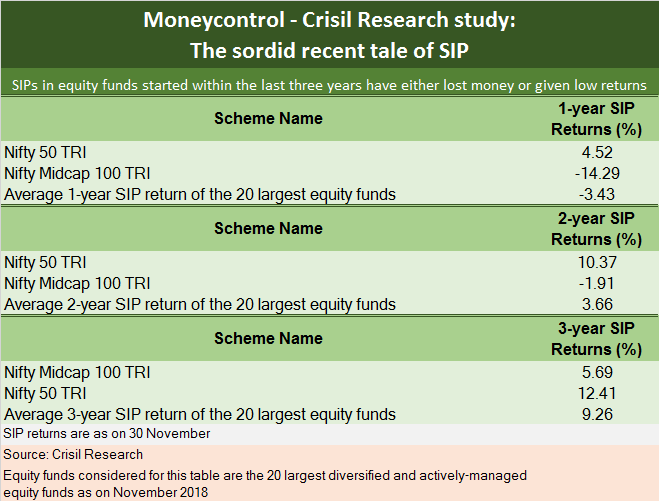 As per a Moneycontrol-Crisil Research Study, if you had started a SIP in the 20 largest equity funds a year ago, you’d be sitting on a loss of about 6 percent. Mid and small- cap funds were the worst hit. A SIP in HDFC Mid-Cap Opportunities Fund would have yielded you a loss of 14 percent and a SIP in Franklin India Smaller Companies Fund started a year ago would have yielded you a loss of 22 percent. If you had started SIPs in these same funds two years ago, you would have made a paltry average return of 3.49 percent. Those who started a SIP three years ago in these funds would have done marginally better with an average return of close to just 9 percent. As India heads into the election year in 2019, several market experts predict the year to be volatile. What if your mutual fund continues to suffer this year as well? Vinod Jain, Principal Adviser, Jain Investment Planner, a Mumbai-based distributor of financial products has started getting panic calls from “quite a few” of his investors. “Those who had started their SIPs 2-3 years ago now say that they would have been much better off in fixed deposits (FD) and recurring deposits since FDs have returned 7-8 percent in the past year”. Among the increasing number of investors who have invested through SIPs is a large chunk who have invested in MFs for the first time. “These investors have not yet seen a market cycle. When my colleagues and I sit in our sales meets with investors to discuss their portfolios and their performances, many of our firm’s relationship managers tell us that first-time investors get jittery upon seeing volatility”, says Shyam Sunder, Managing Director, PeakAlpha Investment Services. Delhi-based, Surya Bhatia, Managing Partner, Asset Managers, says nearly 80 percent of his customers have been around for years and have seen market cycles. These investors, he says, understand volatility and have been patient so far. “But of the remaining 20 percent, most of them have raised red flags because they’ve tasted loss for the first time”, he adds. Bhatia says such panicky investors then tend to compare equity funds with fixed income instruments like public provident fund, bank fixed deposits and the like. As per BankBazaar.com, Axis Bank offers an interest rate of 7 percent on its 5-year FD. RBL Bank offers 7.2-7.6 percent for FDs of five years and above. Equity funds’ returns in 2018 pale in comparison. As per Value Research, while equity large-cap funds lost 4 percent on an average in 2018, mid-cap funds lost 14 percent and small-cap funds lost 21 percent, in 2018. “Bank FD rates have gone up of late. Some investors feel that if by taking additional risk in equity funds, they have earned just 2-4 percent over the past 2-3 years, then they would have been better off putting away money in FDs instead”, says Sanjay Sapre, President, Franklin Templeton Investments – India. The trick to get SIPs work in your favour is to be patient. Assume you had started a SIP on January 2, 2007 in rising markets. If you had panicked in 2008 after the global market crash on the back of credit crisis and had withdrawn at the end of 2008, you would have lost around 33 perceny. 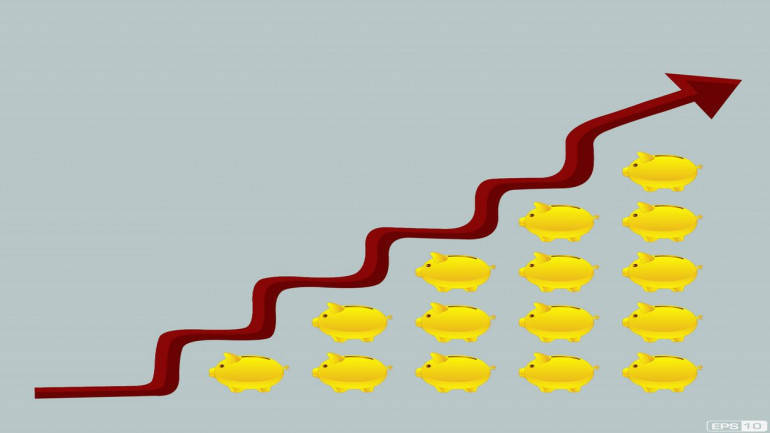 If you had stayed invested till the end of the year of 2011, you would have made a marginal gain of 4 percent. But if you had stayed on till the end of 2017, you would have made 16 percent. We only took the 20 largest equity funds at the start of 2007 for this study. “Even if markets are flat for three or so years, you would still accumulate your principal if you do your SIP diligently. Then, in the fourth or fifth year, if markets rise, your returns also shoot up. Since you cannot time the market, a SIP is a vehicle that absolves you of market timing”, says Jiju Vidyadharan, senior director, Funds & Fixed Income Business – CRISIL Research. 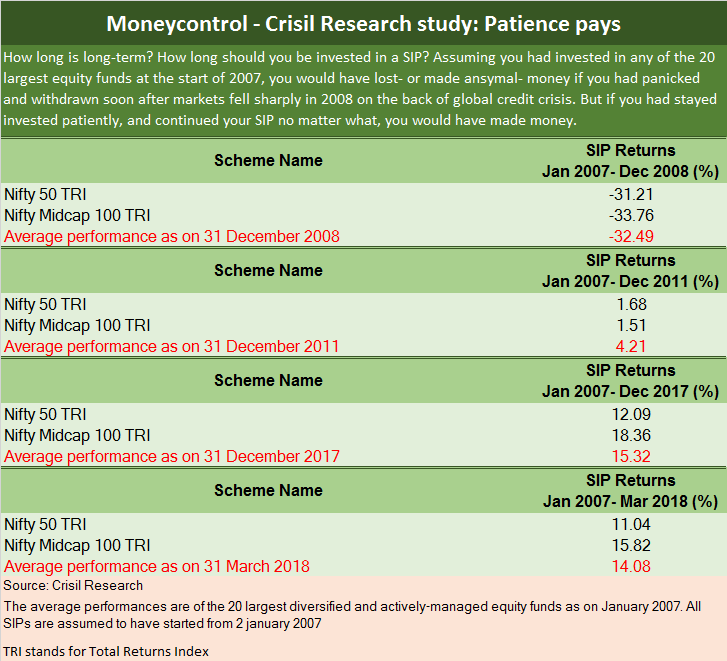 He says in a separate study that Crisil had done earlier, of a series of 10-year benchmark index returns that it had taken, the returns (10-year) were at least 10 percent in 70-80 percent of the times. Avoid SIPs if you think you’ll need your money before five years. But if you wish to build wealth over time, you must invest in equities. And SIP is a good tool to make the volatility work in your favour. “Investors most often think logically when they start investing in equities but when markets disappoint, they can’t see their investment values going down. Looking at past returns, first-timers have come with excessive expectations. Let’s not forget: good things take time”, says Ravi Kumar TV, Director, Gaining Ground Investment Services.Stay invested and continue your SIPs.